It is a tumultuous period in feudal Japan. The samurai have wrested power from the emperor, and the nobles are conniving to take it back. The protestant Dutch and Portuguese and Spanish Catholics are competing for trading privileges, but the shogun is suspicious that the church is planning to replicate the conquest of the new world in Japan. Alcala, an elusive renegade Jesuit, is colluding with the ruthless Prince Sanjo to foment a Christian rebellion. The church wants Alcala stopped. Jan Kriek, a newly ordained priest, is sent to Japan stop him. He is aided by Maria, the daughter of the Christian lord Arima, who sends her to Lisbon with a dire warning of impending disaster. Accompanying her on the return voyage, Kriek finds himself torn between his Jesuit vows and his blossoming love for Maria. The key to a successful Christian uprising is a hidden treasure pilfered from the shogun’s gold mines. The search for the gold leads to deadly conflict between agents of shogun the conspirators who seek to depose him. When Shogun's heir is captured by Prince Sanjo, the shogun’s chief counselor sends his son Gyozen and adopted daughter Aya, both masters of the sword, to find and retrieve him. It is a decision that has unforeseen and fateful consequences. 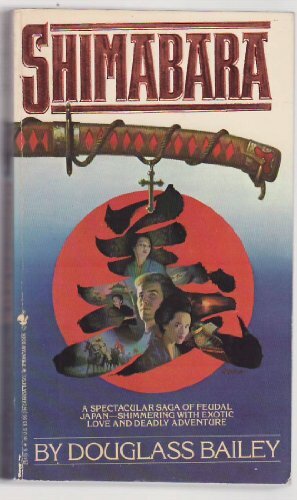 The characters that inhabit this novel are fascinating, and the absorbing story of intrigue, betrayal and forbidden love culminates in the infamous battle of Shimabara, a battle that changes the course of Japanese history for centuries. Douglass Bailey is the author of Fortune, a novel based on the salvage operation that recovered a fortune in seventeenth century Spanish treasure off of Key West. He has written hundreds of hours of network television programs, including award winning documentaries, sit-coms and scripts for feature films. He is a graduate of Washington College, and did his graduate work in philosophy at West Virginia University. He is currently living with his wife and three dogs in Santa Barbara, California.